Visiting Stan and Julie Simpson at their mountain vineyard, one senses that they are on top of the world, enjoying the moment as they bask in the beauty around them. It’s no wonder: their single-vineyard Merlot has what it takes to achieve cult status; Stan’s hand-built home reflects his artistic craftsmanship; his vineyard commands spectacular views of the North Bay. Stan began his career as an industrial arts/art teacher in Southern California. He next ran his own cabinet shop in Laguna Beach, from which he designed and supplied furnishings for many up-scale homes in the Orange County area. In 1970 Stan and Julie spent a year of study in Denmark. Stan’s background as a craftsman and his artistic eye found articulation in the Scandinavian sense of design. "Danish woodworking shows off the grain of the wood rather than the dexterity of the woodworker. The lines and cuts are clean, the impact on the wood non-intrusive." This concept would serve not only as a guiding factor in designing and building his own home on McCray Ridge, but also as an influence in the attitude he would bring to grape growing and winemaking. In 1972, while exploring Sonoma Countys back roads, the Simpsons discovered and purchased their 40-acre mountain parcel. At that time, the property had nothing  no water, no electricity, no structures, no fences. Nothing but a fantastic view of the Sonoma valley and a dry, un-farmed four-acre patch of red grapes that no one could identify for certain. At first, Stan tried living there and farming here. 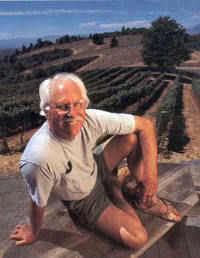 Then, in 1985, he sold his woodworking business in Laguna Beach and moved to Sonoma County to study viticulture at SRJC, become a full-time farmer, and build a home. The first couple of years, an 8’x10’ trailer made do while wells were dug, electricity and telephones introduced, and plumbing installed. In the vineyard, Stan single-handedly tore out the old vines, pulled roots, prepared the soil, and planted four acres of bench-grafted Merlot vines. Between growing periods, he began building a home. Room by room, year by year, with meticulous care given to every large and small detail, a cottage began to emerge. One that illustrates Stan’s guiding principle of not tampering with the inherent beauty of a thing, maneuvering it only enough to allow the beauty to emerge. 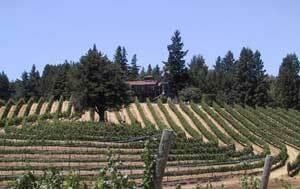 It is the principle by which Stan Simpson planted his vineyard, built his house, and makes his wine.